Shoreline Hydrotherapy® is a progressive manufacturer of hot tubs and whose company motto is ‘Built up to a standard not down to a price’. What do we mean by this? In recent years the cost of manufacturing has increased dramatically. Other hot tub suppliers, often USA made, have kept lower prices by lowering the quality of their product by cutting back and fitting cheaper equipment, making thinner shells, less expensive wooden or ABS bases, etc. Outwardly their product may look OK or in some cases they may even look good but on closer inspection and by comparison a Shoreline™ hot tub is stronger, has a thicker stronger shell, a better support frame and base, more, higher quality jets and offers a better hydrotherapy massage. 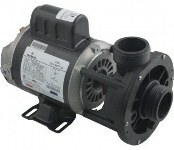 It also has superior quality pumps, superior control system. It is more energy efficient and is greener (carbon offset option for 20 years of use). It will cost you less to own and run, cause you less hassle and last at least twice as long as many other hot tubs available on the market. Shoreline™ hot tubs hold over 15 individual trademarks on their current range of hot tubs and swim spas many of which are registered and carry patents or are patent pending. Shoreline™ hot tub components comply with and are registered with 14 different international manufacturing standards including UKAS ISO, CE, CCC, KC, SAA, TUV, GS to name a few. Please see the bottom of the page for all the standards. All Shoreline™ hot tubs are fitted with ShoreLight™ premium low energy multi-coloured mood LED (Light Emitting Diode) lighting as a non-cost option to help create a soothing tranquil ambiance for the discerning hot tub owner. Some Shoreline™ hot tubs are fitted with the low energy multi-coloured LED Lighting Array with LED perimeter lighting as standard. The ShoreSound™ premium sound system is a quality system. Available as standard on the Amalfi, Capri, Barcelona, Palma, Valencia and Monterossa hot tubs. The ShoreSound™ Bluetooth Premium Music System is a high quality, robust and durable waterproof marine grade system with resistant pop-up speakers and a sub woofer speaker. ShoreFloor™ is a total floor system and standard on all Shoreline™ hot tubs. It is considered the strongest hot tub base in the hot tub industry. ShoreFloor™ is base made of a thick ABS, designed to be impact resistant and rodent proof. 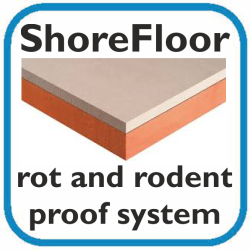 ShoreFloor™ is not to be confused with cheaper bases, which are not rodent proof. All Shoreline™ hot tubs (and swimspas) have the ShoreSupport™ stainless steel cradle system underneath the ShoreCast™ shell. Shoreline™ hot tubs do not rely on lesser expensive ABS or soft wooden supports. The ShoreCast™ acrylic system is utilised on all shoreline hot tubs and is one of the strongest shell systems in the entire hot tub industry. Only the thickest Lucite® acrylic is used (Lucite® was invented in a joint venture between two British companies ICI and Courtaulds) and is the largest manufacturer of cast acrylic in the world. 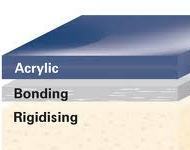 The Lucite® acrylic is coated with a Microban® antibacterial treatment. The ShoreCast™ shell is made by using a combination of heat and a composite of plastics and resins that are laminated to form a thick, incredibly strong one piece shell. How many hot tub shells are offered with a lifetime* warranty against shell leakage? All Shoreline™ hot tubs are designed with comfort as the overriding criteria. Careful application in the science of ergonomics has been employed in the design of the seating positions, heights and reclining rakes etc. and taking into account different customers heights and sizes we believe we offer the most comfortable relaxing hot tub seating available on the market. Shoreline™ hot tubs are fitted with ShoreSet™ Hot Tub Control System. Some Shoreline™ hot tubs models incorporate Balboa® Solid State Control System. Balboa® have been the market leader in hot tub control systems for over 15 years and are widely accepted as being the manufacturer of the most reliable control systems in the hot tub industry. ShoreSet™ control systems are very simple to use and will accurately control your desired temperature and filtration cycles without the need to be a computer programmer. These control systems have the added benefit of a built in self diagnostic system. The water is heated via a Balboa® non-immersion ceramic coated element, water heater or by the optional ShoreHeat™ heat pump. All Shoreline™ hot tubs are fitted with the ShoreClean™ micro filtration and ozone system. This system cleans the water using a microfilter and a Corona Discharge ozone generator, which injects ozone through a Mezzei® injector to further aid in cleaning the water. This system also reduces sanitizer levels. Most Shoreline™ hot tubs have a built in self-cleaning function which gives additional cleaning after each use. A choice of water treatments is available with a BISHTA approved non-chlorine water treatment. All Shoreline™ hot tubs are hydrotherapy hot tubs and are fitted with Hydropro™ jets. Hydropro™ hydrotherapy jets are unique to Shoreline™ hot tubs. They are attractive in design and are long lasting due to special low friction materials utilized that eradicate the need for standard ball bearings which are so often the failure of lesser quality. Hydropro™ jets are uniquely designed to infuse warm air (please see ShoreSeal Insulation™, Re-Heat™ section) into the water in a specially designed patent pending mixing chamber built into the rear of the jet. 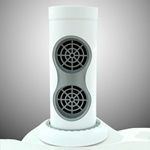 This very effectively mixes up to 45% air to 55% water for an invigorating hydrotherapeutic massage. Most Hydropro™ jets are fully adjustable and are all capable of giving you a deep tissue massage. Each seat massages different muscle groups; no two seats are the same in any one Shoreline™ hot tub. WhisperPump™ pumps incorporating Whispercirc® circulating pumps and Whisperhiflo® & Hiflo® manifold plumbing. 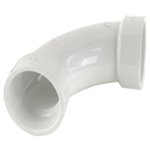 Hiflo® manifold plumbing utilizes large bore pipe with large swept bends#. This increases the flow and therefore enables a larger volume of water to pass through than on a conventional hot tub. The Whispercirc® circulation pump will provide the cleanest, purest water found in any hot tub whilst being virtually silent in operation and energy efficient. The volute, diffuser and internal waterways of the Whispercirc® pump are designed to help prevent clogging which is the demise of other lower quality hot tub circulation pumps fitted to other hot tubs. WhisperHiFlo™ Hydrotherapy pumps are virtually silent running hi-torque motors, which operate at lower a revolution per minute than conventional hot tub pump motors. The motor is bolted to a specially designed wet end that can pump a larger volume of water than a conventional hot tub pump. # The result when utilised with Hiflo® manifold plumbing is a very high volume of water at a lower pressure. This leads to a far more pleasant massage experience and is also more energy efficient. To create the same hydrotherapy massage effect using conventional hot tub pumps, additional pumps would be required leading to higher running costs. Save £££’s every year in running costs compared to rivals. The ShoreSeal™ energy saver heat recovery system does not impair the serviceability of the hot tub components or jets at in any way. The system is a three part system that has been specifically designed to significantly reduce heat loss by stopping heat loss to the outside air and recycling the heat back into the water and therefore significantly reduce energy consumption. The ShoreSeal™ system is designed for the extreme temperatures of the Northern states of the US and Canada. Heat produced by the hot tubs mechanical equipment is not vented away in Shoreline™ hot tubs. It is trapped and re-used. This is called Re-Heat™. As the water moves through the pipes toward the jet it draws air in with it. This is known as a “venturi” action. Most hot tubs have venturis but draw in outside cold air. Shoreline™ hot tubs don’t! In Shoreline™ hot tubs the air is taken from the pocket created by the thermal barrier insulation. Warm air is recycled through the well-secured hot tub water pipes and entered back into the hot tub by the Hydropro™ jets to maintain water temperature – saving energy and saving you money! 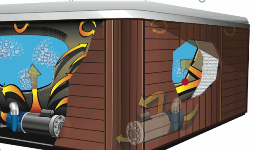 Perhaps the most important part of the Shoreline hot tubs ShoreSeal™ system is the Heatlok™ 523 cover. The Heatlok™ 523 cover is one of the most effective heat retentive hot tub covers on the market and is included with every Shoreline™ hot tub model. 85% of all heat lost is through convection and evaporation. A high quality hot tub cover is singularly the most important thing to keep running costs down. High value visqueen vapour wrapped Heatlok™ insulation batt. All Shoreline™hot tubs are supplied with the WeatherGuard™ synthetic cabinet as standard. WeatherGuard™ hot tub cabinets are insect proof, moisture proof, fade resistant and maintenance-free. They carry a lifetime* warranty that the sun, rain, snow will not split, crack, peel or rot a WeatherGuard™ hottub cabinet. Shoreline™ hot tubs are proud to introduce another industry first. Shoreline™ hot tubs are one of the most highly efficient, low energy consuming; environmentally friendly hydrotherapy hot tub ranges ever available in the UK. However, should you wish to reduce your power consumption even further and be even more environmentally friendly, then all you need to add is the ShoreHeat™ heat pump option to your purchase. 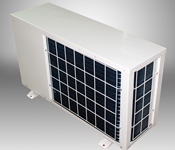 The ShoreHeat™ heat pump is integrated into the ShoreSet™ Balboa™ control systems. It is an intelligent system and is the latest generation of air source heat pumps to utilize the latest technologies, including processor, software, titanium composite heat exchangers, rotary compressors and they all have reverse-cycle defrost capability and are designed to work at temperatures as low as -5ºC and above. The co-efficiency of a Shoreline™ hot tub fitted with a ShoreHeat™ heat pump is approximately 1 to 5. This means when your heat pump is working at its maximum capacity, for every 1KW of electricity consumed you will be getting approximately 5KW worth of heat (that equates to 4KW of heat you have not had to buy! 4KW of FREE HEAT!). Every other hot tub sold within the UK for every 1KW power consumed at best you will get 1KW of heat, which is a co-efficiency of 1 – 1. The heat pumps work on the principle that absolute zero is -275ºC and anything above that is a heat source. No heat pump in existence to date can extract heat at temperature as low as -275ºC and some heat pumps can’t extract heat until the ambient air temperature is over 20ºC. The ShoreHeat™ heat pump will work at an ambient air temperature of -5Cº and above. The greater the temperature the greater the efficiency. For those customers who wish to enclose their hot tubs, all ShoreHeat™ heat pumps have the ability to work in reverse and cool the water. A chiller function is useful for hot tubs situated in conservatories and sunrooms. For further information about The Hot Tub Company or to enquire about buying from our superb range of hot tubs and swim spas, please don’t hesitate to get in touch with our friendly and dedicated team. * All warranties are defined in and limited to The Shoreline Hydrotherapy™ Hot Tub Warranty Document. ** Available at extra cost. # Please see individual models for exact specification.